This weekend, my dining partner and I were searching for a good brunch place where we could fill our bellies on Sunday morning. We came across Queens Comfort in Astoria on Yelp, which received fairly high reviews (not that this means anything; it means nothing, really). I’m not a huge fan of Astoria, but I thought we’d give it a go anyway. We arrived at 10 AM because both Yelp and Google stated this to be the opening hour. In fact, Queens Comfort opens at 11 AM. We killed time at a local bakery, tasting pine nut cookies and pear marzipan. 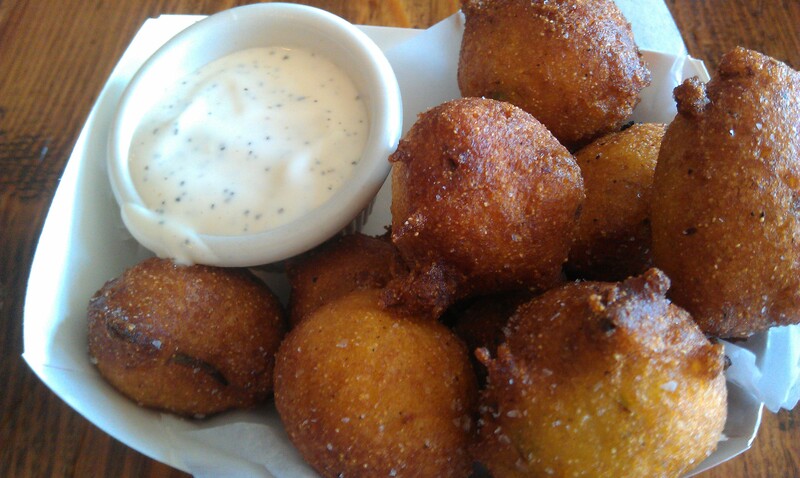 Once we sat down in Queens Comfort, we ordered hush puppies with housemade ranch dressing. The ranch didn’t have the sharp tang that so many ranch dressings have. Rather, it was light and deliciously seasoned with black pepper. The hush puppies, made of corn meal and spices, were small, but solid in flavor. For entrees, MDP ordered pork and grits, and I ordered a fried green tomatoes sandwich. 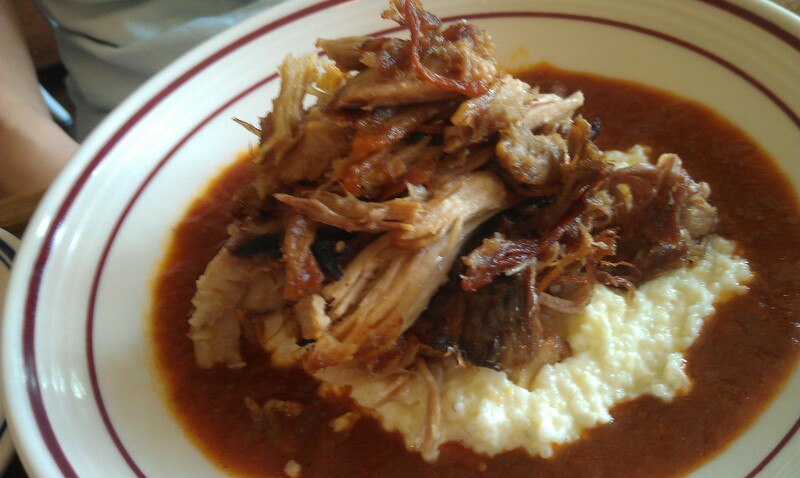 The pork and grits was fantastic. I liked this better than my sandwich, which came with overcooked french fries. The pork was crispy and the grits were creamy. A moat of barbecue sauce lined the periphery of the plate. Yum! 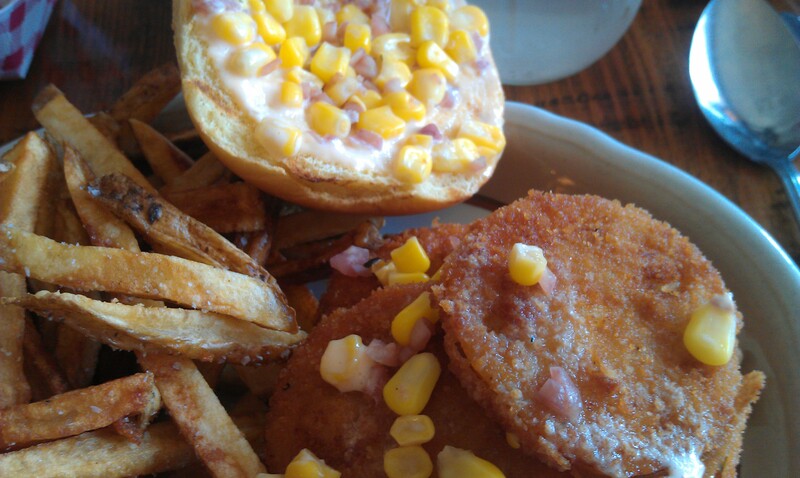 The fried green tomato sandwich had three slices of tomato on it with “chow chow” (corn drenched in tangy sauce) on top. It was assembled on a Martin’s potato bun. I thought it was good, but it lacked the crispness I imagined the fried green tomatoes would have. 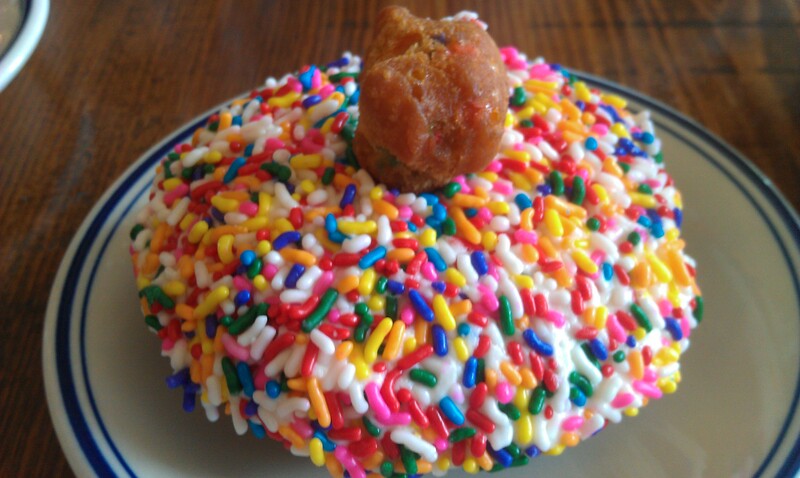 Last–because we hadn’t eaten enough–we ordered a Funfetti housemade doughnut. It was sugary and tasting of fried. We didn’t finish it, feeling fatty enough. Queens Comfort was pretty good, but Lowcountry (review here) is much better. We calculated that it would take only a few minutes longer to get to Lowcountry from our residence, which means that when we’re craving comfort food, we’re likely to go there.